Having looked at some of the truly amazing purse frames that were available as luxury goods in the Late Middle Ages in Europe, it is now time to come back down to earth and my original project to study and create replicas of original purse frames. So, this is what I decided to start with. This is a picture of the actual artifact that I own. I have broken pieces of several purse frames, most of which are for considerably larger purses, but I decided to start small and simple. My goal with this purse was to replicate the actual frame of a real purse, without any of the preconceived notions or gaps in knowledge that I had on my last project. I also wanted to see if I could actually cast all of the pieces that they would have cast, instead of using a bunch of formed metal pieces. I wanted to create a purse frame that any middle class individual from western Europe would instantly recognize as a “normal” purse frame. First let’s give a few facts about my purse frame. The frame was found by a metal detectorist in England. It is cast of bronze. The purse bar is 61 mm long (2 3/8 inches) and the pivot top is 13 mm across (about half an inch) and 22mm top to bottom (about 7/8 of an inch). It is a small purse, probably originally intended for coins. The pivot actually does spin around all the way on this purse frame. I am not certain what the advantage to this would be, but perhaps turning it with the front against you would make it more difficult for pick pockets to get into. So how did I start on this project? First I spent quite a bit of time just looking at the frame. I wanted to understand how it was made. Was it all cast? Yes, although it is possible that the washer at the bottom of the pivot was actually created from a heavy piece of plate bronze. Were there any places that were soldered? How were the pieces held together? The answer to both of these questions is related. There is no detectable solder on the piece. The parts are all riveted together by peaning over the ends of the metal purse pieces. How many pieces were there? What pieces appear to be missing? This is a difficult set of questions to answer. 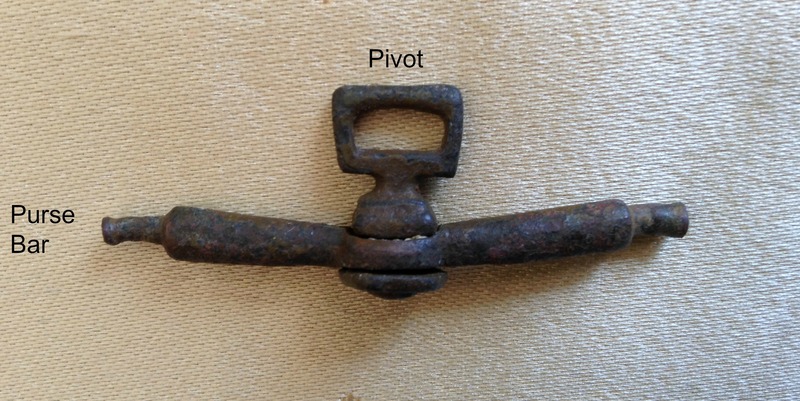 The surviving frame consists of three pieces: the purse bar, the pivot, and a washer on the bottom of the purse bar that helps keep the pivot in place while allowing the pivot to rotate. The bare ends of the purse bar show wear marks. There was originally at least one purse ring, and possibly two. There does not appear to have been a washer on the ends of the purse bar to help retain the purse frame rings, but it is possible that there was, and it didn’t leave a discernible mark. Next Time: Where Do We Go From Here? This entry was posted in Dress Accessories, Leather Purse or Belt Pouch With Brass Frame, SCA Life and tagged Medieval purse, Medieval purse with metal frame, Medieval purses by Eirny. Bookmark the permalink.